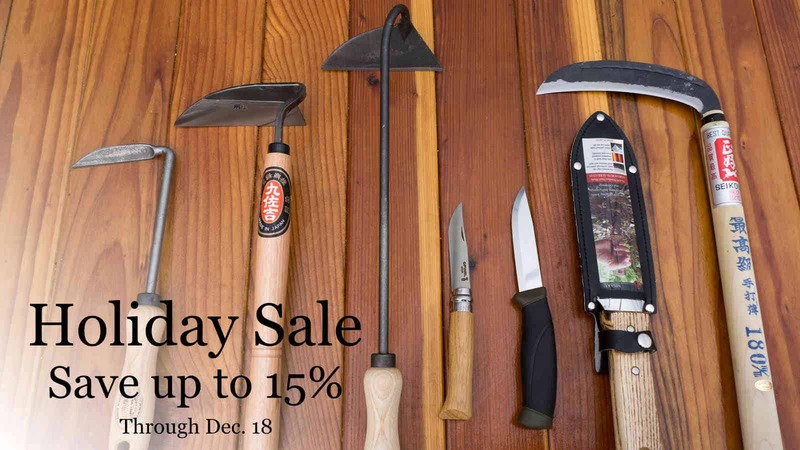 Quality Garden Tools on Sale! My little online store, The Tool Merchants, is running a sale for the next couple weeks. You can read the details here, but here's the gist of it. Use coupon code clearout5 to take an extra 5% items in our clearance section. I'm putting together a list seed of companies and plant nurseries, and have reached the end of my rope, so to speak. I'd love to know where you've bought stuff from? I think walnut oil would work just fine, might be a bit expensive though? I just put together a short post and video sharing my process for tending to wooden tool handles. Nothing fancy here, but I thought it might be helpful to any beginners out there. You can read the text version here. I'm curious if your process is similar or how it differs? I recently put together a video demonstrating the wonders of using a Japanese sickle in a polyculture orchard. Mostly, I blab a bunch and cut down some comfrey and grass. Thanks for watching and feel free to leave some feedback. ps. You can purchase a sickle here. and be sure to use the coupon code "permies" at checkout to save 10%. You can definitely prune your trees with a bypass pruner. You'll want to add a lopper or a pruning saw to your kit once the branches you are cutting get to be more than an inch or so thick, as most hand pruners cut between .5 inch to 1 inch diameter branch. There are lots of choices as far as brands and specifics styles of pruning tools. I really like bahco pruners and loppers. The steel is really good and they are made to last under heavy use. Read: Lifetime tool for the average user. As for saws, there are even more choices! Not just brands but also lengths and and teeth density etc. Here are a few things I've learned: Generally, a given length blade will cut a branch diameter of half the blade length. IE. A 10 inch blade will easily cut up to a 5" branch. This can probably be extended but you get the idea. TPI stand for teeth per inch. Basically, the less teeth per inch the faster a saw will cut but it will leave a rougher edge. More teeth per inch will cut slower but leave a smoother edge. In my experience, I prefer a medium 7-9 tpi for pruning fruit trees and reserve a larger saw with less teeth (5-6 tpi) for cutting pines and firs in the forest. All of the above details being equal, a curved saw might cut faster than a straight saw, but a straight saw is better for pruning where branches are crowded. The Silky brand makes very good pruning saws. The Gomboy might a good choice for you. We also carry an excellent Japanese pruning saw. Finally, Fanno has a pretty good reputation and their pricing is lower than the Japanese saws. Thanks for the feedback, Devin. We've had a Vita Mix for about 5 years now. We probably use it a few times per week so not that much. So far it's going strong and it is a great blender. Hi Folks! My guess is that most of you know how to sharpen your garden tools already, but just in case you don't, check out my new blog post and video. This is fundamental stuff that I wished I'd known when I was starting out. Sharp tools make your work easier! Thanks for checking it out and please leave some feedback!